10 April 2015, at 12:00a.m. At the Danbred International Seminar at VIV Asia 2015, Jørgen Lindberg of Danbred explained how more than 30 pigs per sow and year are achieved at their farm in China using a successful combination of Danish and Chinese appreoaches to pig management. Stuart Lumb reports for ThePigSite. Scandinavian Farms is the first Danish agricultural business to invest in China, with the farm company being headed up by CEO, Jørgen Lindberg. Mr Lindberg manages a 5,000-sow unit which is situated north of Shanghai and is close to the sea which is ideal regarding biosecurity. The farm originally just produced slaughter pigs but is now a multiplier farm producing F1 Landrace / Yorkshire gilts. The farm has utilised the expertise of the Danish Farm Concept Company, which provides a turn-key package comprising Danbred International, Hamlet Protein, Skov ventilation, Vissing Agro (equipment), Danish Farm Design and Dalum Agricultural Academy (training) and operates to the same high standards as units do in Denmark. Biosecurity is very tight (including four guards are on the payroll) with staff showering in and out, and great care is taken to clean down ramps when pigs are dispatched from the unit. The unit has its own feed mill run by four staff, using high quality ingredients, with barley being used in the gestation ration to stop stomach ulcers. Well designed and robust equipment is essential to get maximum output. Automatic feeding is used, to reduce mundane work and for accurate feed dispensing. The farm has a labour force of 84 in total, although 25 per cent are off at any one time due to staffing rotas. A flushing system is used to remove slurry from the buildings and heat pumps extract energy from the warm slurry. Electricity is also generated by the farm’s own windmill. The farm is situated in a hot location and so a top quality Skov ventilation system has been fitted. This gives a good environment both for pigs and people, maximum productivity and helps maintain a high health status. A wide ranging vaccination programme is operated with the farm having a health status as high as the healthiest pig farms in Denmark. Foot and moth disease (FMD) and classical swine fever (CSF) vaccinations are legally required, plus pigs are also vaccinated against Aujeszky’s disease, Japanese Encephalitis and APP. Healthy pigs drink a lot of water and the farm uses nearly 300,000 litres per day, plus 12,000 litres for cleaning and power washing. Fortunately, the water can be extracted from a nearby river and is then purified. Breeding stock and all other pigs consume 118 tons of feed daily and produce 295 tons of slurry every day. Intelligent staff are naturally needed. New employees are taken on from non-farming backgrounds and are put through a good basic educational programme. Staff are nurtured and mistakes are tolerated – not the usual way in China. It is vital that pig flow is regular and that the unit is kept fully stocked. For the farm, the target mating figure is 250 per week, which allowing for returns, will give 230 farrowings per week. Gilts are seven-and-a-half to nine months old at service and flushed for seven to 14 days before service (4.0 feed units FU per day). They are inseminated twice on the second heat. Sows are flushed from weaning to service (5.0 FU per day). The five-point heat stimulation plan is closely followed, which includes sitting on the sow’s back. The boar is only brought close to the sow during insemination to get good conception. Feed rates are high for the first 28 days after service and reduced to low until day 84, after which they are increased again until day 114 before being dropped to low until farrowing. Scanning takes place at five weeks. Vaccinations are given as appropriate. Quiet is an important feature, while there is regular observation and assistance/ internals carried out when necessary. Because DanBred sows often produce more piglets than they have teats to suckle them, a very ingenious technique has been developed. The 'two-step nurse sow procedure' ensures that the maximum number of piglets is reared. A sow that is milking well has her piglets taken from her at 21 days of age and she is then given piglets from a sow that has been farrowed for seven days. Surplus very young piglets, after receiving colostrum, are then fostered onto the sow that has been farrowed seven days. This is excellent given that the herd is young and productivity should get even higher as the sows get into their fourth and fifth parities. 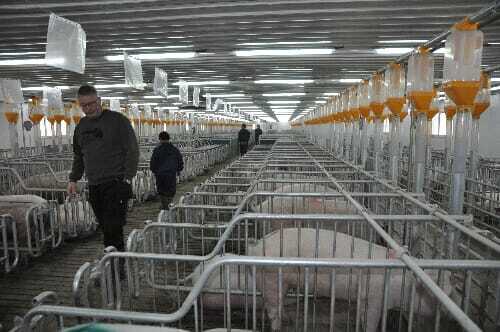 Pigs are inspected twice per day and all are made to stand up and move round. Any pigs showing illness or abnormal behaviour are spray marked and treated and/ or moved to a hospital pen. All weaner pens each have an individual drinker & pipeline to allow medication if needed , to be given on a per pen basis. Normally on most units this is usually done on a per house basis, i.e. blanket medication, which wastes drugs. The weaner pens all have covers over the lying area and these can be adjusted so that the pigs are neither too hot nor too cold. The lying behaviour of the pigs shows if they are too hot or to cold and the ventilation system can be adjusted accordingly. Feeding is ad lib for most of the finishing period , but the feed has to be restricted to a maximium of 2.8kg / day as the pigs approach slaughter, in order that the pigs stay lean. Generally Chinese pig units have not been noted for their high productivity but DanBred has shown that it’s possible to produce over 30 pigs weaned per sow and year, which is great news as the Chinese really love to eat pork, as often as possible. Go to other reports from VIV Asia by clicking here.